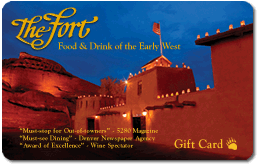 The Fort, is conveniently located just two miles south of the Amphitheatre and is now offering a Red Rocks Special Concert Night menu, designed especially with concert-goers in mind. The Red Rocks dinner menu features entrées that can be prepared more quickly, in order to let concert-goers enjoy their meal, and still make the evening show. The Fort’s patio has been revived and diners are welcome to sit in the warm evening glow with stunning views of Denver. Fort Breads -A selection of pumpkin walnut muffins and dinner rolls. ** Entrees wishing to be prepared well done will be butterflied to expedite cook time. Add a side to any entree of an elk medallion for $22, buffalo sirloin for $18, buffalo rib for $14, or quail for $11. For a listing of concerts and events at Red Rocks Amphitheatre, visit http://redrocksonline.com.